I climbed into bed at close to one o'clock last evening after hammering out yesterday's blog, only to wake at 05h20 after a period of restless dozing. The room is rather airless and warm - fetid might sum it up quite well - and the bed not exactly the last word in pocket-sprung, state-of-the-art comfort. I managed another 45 minutes or so, but resented my alarm. My first appointment was in Chassagne at the Domaine Guy Amiot. What a splendid way to explore the fascinating terroir of this appellation without moving very far. At Amiot, they make wine from a good number of Chassagne Premiers Crus, as well as St Aubin, the hyper-rare oddity Puligny-Montrachet Les Demoiselles, plus Le Montrachet. What a wonderful addendum to breakfast! From there to one of the finest makers of red wine anywhere in Burgundy: Michel Lafarge in Volnay. Michel's son has now taken on the lion's share of the work at the domaine and it was he who showed me the domaine's extraordinary collection of 2007s. Walking through the cellars, we passed a disused staircase on which lay some rank-looking excrescence. This turned out to be bottles from Frederic's birth year: 1958. The bottles gave me hope that if I stand still for long enough, I may grow hair again. From Volnay back to Chassagne to an estate new to me: Morey-Coffinet. We tasted it a beautiful vaulted room not dissimilar to that in which I had been tasting in Beaune the evening before. I'll publish a photograph of it in the offer. 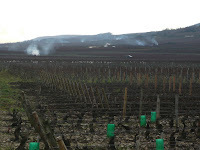 A quick stop for a bite was all I could afford before heading to Meursault and another domaine new to me: Buisson-Charles. What extraordinarily friendly people. My French is improving by the hour - it must be the air - and we had a good chat. Their wines are exemplary: Meursault of the best sort. One more to go and I dragged myself off to the small village of Gamay that lies behind St Aubin, not far from Chassagne. Here, in a warehouse-like winery, Marc Colin's domaine produces a range of superb, terroir-driven, mineral St Aubins, plus Chassagne, Puligny and a very fine Corton-Charlemagne. The cherry on top was another Montrachet. What a way to finish. What a day! If I wasn't so tired, I would feel rather spoiled. Quick blast to Chablis tomorrow for two early appointments, then a race to La Manche; 40 minutes in a train under the water and a 2.5 hour drive home. I will then need a bath and quite possible a little calming whale music.